Surgical orthodontics (or Orthognathic surgery) is the surgical correction of jaw abnormalities when orthodontics alone cannot fix the skeletal disharmonies. In these types of procedures an orthodontist and a maxillofacial surgeon work in tandem to achieve the best potential outcome. First, Dr. Neil and a maxillofacial surgeon coordinate a treatment plan. Next, treatment will start with braces. Braces will be worn for 6-18 months in preparation for the surgery. Once Dr. Neil feels the patient is ready, the patient will undergo the surgical procedure with the braces on. The bite and facial balance will improve immediately after the surgical procedure. Once the surgical procedure is complete, Dr. Neil will use the braces for several more months to make final finishing improvements, and then the braces are removed. 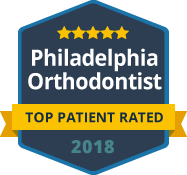 Dr. Neil works with several teams of orthognathic surgeons in the Philadelphia area, including those at the University of Pennsylvania, Jefferson Hospital, and Temple University Hospital.